If you’ve moved beyond using two saw horses and a scaffold plank for a work surface, you may want to consider Skil’s new XBench. It may look like a plain table, but some simple details and a variety of accessories set it apart from other work surfaces. 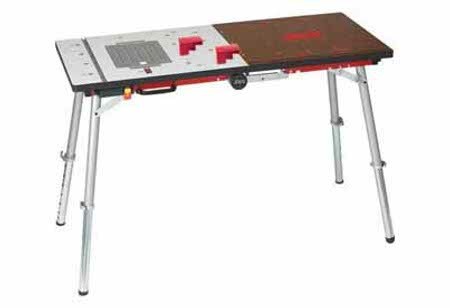 You can adjust the bench’s telescoping legs to work at different heights or different surfaces easily. You can fold it in half to move to the next location. If you’re cutting with a circular saw, you can split the top of the bench to create a channel for the blade to pass through while fully supporting your material. You can even plug that saw into a built-in outlet, complete with bumpable kill switch. All of this would add up to a decent table, but add the accessories and it really starts to get interesting. The Xbench’s removable insert plate can accept different Skil brand tool accessories. You could invert your jig saw and attach it to an insert to make a pseudo-scroll saw. You can make your belt sander into a sanding table, your drill into a drill press — or you can make the Xbench into a router table. You can also get a variety of shelves, bench dogs, clamps, and a downdraft table. Note: The XBench doesn’t accept the Skil contractor’s table saw. The XBench takes on a lot of different tasks, but if you’re a Skil tool fanatic, it might be just the thing. Street pricing for the XBench is $195, but Amazon has it for $174. Accessories range anywhere from $90 for the drill press to $22 dollars for the jigsaw plate. A video on Skil’s Xbench website shows the different accessories in action. Whatever happened to their X-table? Same theory, but more of a cabinet with built in storage? Looks interesting. I wonder if it’s really sturdy or just some wobbly chiwanese junk. Anyone seen one in real life? I have one and really like it. I just wish the inserts would accept other tools, e.g., a porter cable router. Chuck, do you still have your Skil Bench and if so, would you be willing to sell it?